A falling-block puzzle game from Russia. The screen fills up with "Tetrads", shapes made up of four blocks. Move, rotate and stack the blocks so they form rows. Completed rows will disappear. If the blocks stack to the top of the screen then the game is over. Game A is an endless game where the speed increases as you clear rows, and Game B requires you to clear a set number of rows at a certain speed to win the game. 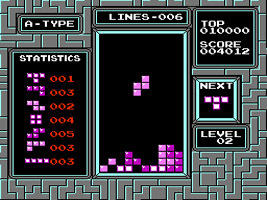 The rights to produce versions of Tetris at the height of its popularity were hotly contested by a number of parties. The Japanese Famicom version was developed and published by Bulletproof Software, while a US NES version was developed by Tengen. When negotiating the Game Boy rights, Nintendo discovered that the rights to the NES version had not been acquired legitimately. They took steps to secure those rights and block sales of the Tengen version, and the case went to court. 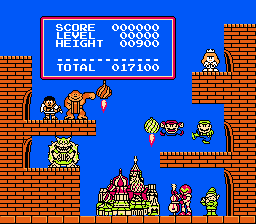 When you complete Game B game on speed 9, height 5 you are rewarded with a scene featuring an all-star lineup of Nintendo characters having a Russian-themed party.